Drive the streets of Nairobi, and you are sure to see many matatus—colorful minibuses that transport huge numbers of people around the city. Once ramshackle affairs held together with duct tape and wire, matatus today are name-brand vehicles maxed out with aftermarket detailing. They can be stately black or extravagantly colored, sporting names, slogans, or entire tableaus, with airbrushed portraits of everyone from Kanye West to Barack Obama. In this richly interdisciplinary book, Kenda Mutongi explores the history of the matatu from the 1960s to the present. As Mutongi shows, matatus offer a window onto the socioeconomic and political conditions of late-twentieth-century Africa. In their diversity of idiosyncratic designs, they reflect multiple and divergent aspects of Kenyan life—including, for example, rapid urbanization, organized crime, entrepreneurship, social insecurity, the transition to democracy, and popular culture—at once embodying Kenya’s staggering social problems as well as the bright promises of its future. Offering a shining model of interdisciplinary analysis, Mutongi mixes historical, ethnographic, literary, linguistic, and economic approaches to tell the story of the matatu and explore the entrepreneurial aesthetics of the postcolonial world. 9 Mungiki: Fighting a Phantom? "Mutongi offers a nuanced and rigorously researched analysis that will serve as an excellent model for the study of both history and culture in Africa. . . . A magnificent book that challenges the conventional view of the matatu." "Matatu . . . provides Nairobians with an intriguing and marvelously written history. Mutongi presents the story of the matatu with enthusiasm, narrative élan, and a balanced view of all actors involved. . . . Mutongi is a gifted historian, representing a new generation of Kenyan historians." "The published history of urban transport in Africa has just had an enormous boost. Mutongi’s marvellous analysis of postcolonial minibus taxi transport in Nairobi is such a welcome record and such a remarkable injection of insight. . . . Mutongi’s authoritative deconstruction and story-telling dazzles. Her Matatu becomes the baseline and re-entry point for African minibus research. Her antenna are acutely sensitive. Her phrasings are a treat. Not least, her gorgeously written and accessible presentation is testimony to the enduring value of books as vehicles for argument, learning and pleasure. This book glows with stamina, patient inquiry and careful thought. Its coherence, layering and depth far surpass online capsule histories. Matatu slices with diamond-tipped tools. May there be more such glinting dissections of urban transport history in Africa." "[Matatu] offers important contributions to the literature on African cities, informal economies, mobility, regulatory landscapes, and urban infrastructures... [by] using the matatu sector to highlight the success of African-run business without assistance from government or development agencies... Although laudatory and ultimately hopeful, Mutongi's Matatu does not overlook the darker elements of the sector... [and] will be of great interest to all scholars in disciplines spanning African history, urban studies, anthropology, and geography, as well as scholars of mobility, infrastructures, and the regulatory environment of neoliberalism at work and on the road." "Mutongi’s book ultimately offers a lyrical and fine-tuned account of the city and its inhabitants. Foregrounding the men who owned and operated matatus, the range of people who rode them, and the politicians who tried to regulate the industry, Mutongi effectively uses the matatu as a vehicle through which to understand the connected histories of city-building in a segregated postcolony, urban life, and the political economy of Kenya." "Mutongi has written a lively, meticulously researched history of the matatu industry in Nairobi. Incorporating an array of ethnographic, documentary and archival sources, Mutongi vividly illustrates how matatus, those raucous, crowded, colorful van taxis that ply the city’s thoroughfares, are not merely an indispensable means of transport for the wanainchi (everyday Kenyans), but also significant, highly charged sites of expansive entrepreneurship, economic nationalism, political critique, cultural innovation, gender and generational contests, and common corruption." James A. Robinson, co-author of Why Nations Fail: The Origins of Power, Prosperity, and Poverty. 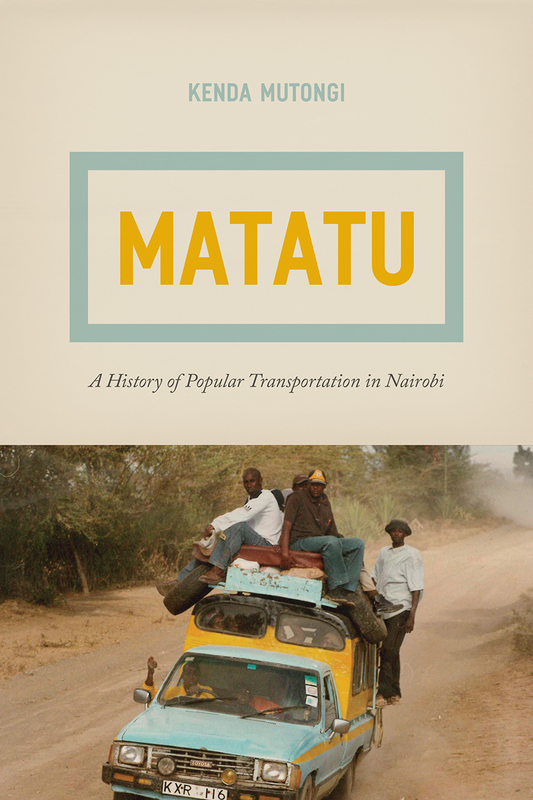 "Methodologically innovative and a joy to read, Matatu takes a unique ethnographic approach to reconstructing the history of Nairobi’s privately owned urban transport from the 1960s to the present. An interdisciplinary work that mixes examinations of business, urban style, political power, mobility, gender, identity, and postcolonial intrigue, Matatu is distinguished by the rigor and breadth of its research, its contributions to African and global history, and the wit and imagination with which it was conceived and executed."